Naughty Dog’s blockbuster sequel came somewhat out of left field for me. Not that I wasn’t aware of it, it just wasn’t on my radar as something I was interested in at all. After playing through (or at least trying to) Drake’s Fortune, I was unimpressed. I thought the gameplay was stale and repetitive, and the set-up was typical “Dude Raider” affair. Luckily, I gave Among Thieves a shot and I was blown away. The graphics are vibrant, the environments are lush, and the facial animation is some of the best to date. The buzz word that gets thrown around all too often when talking about Uncharted 2, is setpiece, and I’m throwing it around aswell. It’s loaded with them, and they altogether form a great action experience. One thing the Uncharted team gets so so right when creating the series is the way they motion capture and voice record. Everything is captured with all actors on set together, which creates a real chemistry between the characters that is fluid and unrivaled in the industry. The voice acting itself is phenomenal, there’s a reason Nolan North is featured in what seems like virtually every other game nowadays, and it’s because he’s the best. 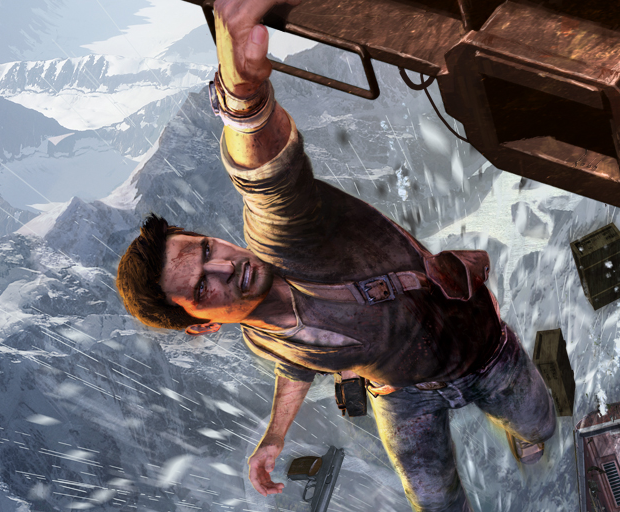 He’s great at what he does; Nathan Drake is entirely his creation and a big part of why the game is so enjoyable. Mark Wahlberg is no Nolan North.